The ITB World Travel Trends Report 2013/14 was commissioned by ITB Berlin from IPK International, organisers of the 21st annual World Travel Monitor® Forum, held at San Giuliano Terme, near Pisa, Italy, in late October 2013. The report covers the main trends in outbound travel demand for the first eight months of 2013 together with estimates for the full year and also contains initial forecasts for 2014, as presented at the Pisa forum (as it is widely known). In addition, it focuses on various topics and market segments that were discussed at the forum, including the growing youth travel market and the changing nature of hostels. Young people around the world are travelling more, spending more and exploring new destinations, according to travel industry experts at this year’s World Travel Monitor forum. Youth travel was long seen as a small part of the travel and tourism industry, characterised by cheap prices and low spending. However, the picture has changed in recent years, according to diverse studies. The World Tourism Organization (UNWTO) estimates that youth travel generated US$ 182 billion in international tourism receipts in 2012, and represented more than 20% of the more than one billion international arrivals. The average cost of a trip by a young person amounted to US$ 910. The number of international trips by young people might increase from 200 million trips a year at present to 300 million by 2020, UNWTO has predicted. The European youth travel market represents nearly half of the global market with some 93 million outbound trips by 15-29 year-olds in 2011, according to IPK International’s European Travel Monitor. With a 23% share, youth travel has a similar share of the European market as worldwide. Most (66%) young Europeans go on relatively short trips of less than seven nights and spend US$ 900 per trip on average. Germany (17m outbound trips), France (7.9m) and the UK (7.3m) are the largest three markets. However, the market is even more valuable when longer or more expensive trips for purposes such as studying abroad, work experience and volunteering are taken into account, according to the World Youth, Student and Educational Travel Confederation (WYSE). Youth travel is a growing segment of the global travel industry, David Chapman, WYSE Director General said at the Pisa forum. ”Young people represent 20% of the total global travel market,” he told the audience of travel experts. The key reasons for this growth are that today’s youth – ’Generation Y’ – has more money to spend on travel, is travelling more often and to more distant countries than in the past, he said. Traditional backpackers are declining while ’flashpackers’ – hi-tech, socially connected young travellers – are becoming a new part of the market. A large-scale survey of 34,000 young people (aged up to 35) in 137 countries carried out by the association showed changes over the last decade. Fewer than half (45%) of young people now travel on holiday while nearly as many (38%) travel for educational purposes (e.g. language learning, study). There is also a significant number (15%) travelling for work experience purposes while about 5% travel due to volunteer projects. The drop in the ’holiday market share’ could be due to a rising number of unemployed young people using their ’free time’ to travel for work, educational purposes or cultural experiences, according to WYSE. One interesting trend is that a lot more young people now describe themselves as ”tourists” – nearly 30% in 2012 compared to about 15% in 2002. In contrast, the number of ”backpackers” has fallen to about 15% from more than 30% a decade ago. Low-cost coach (bus) / train travel remains the main form of transportation but the importance of air travel has soared in recent years due to the growth of low-cost airlines, according to WYSE. Similarly, young people are also staying in hotels more often than in the past, due partly to the rise of low-cost hotels (see also separate section on ’Low-cost Accommodation’). Hostels and hotels are now on the same level with about one third of the market each, ahead of cheaper or private accommodation. Younger people under 25 tend to prefer hostels while the ’older’ end of the youth market prefers hotels. 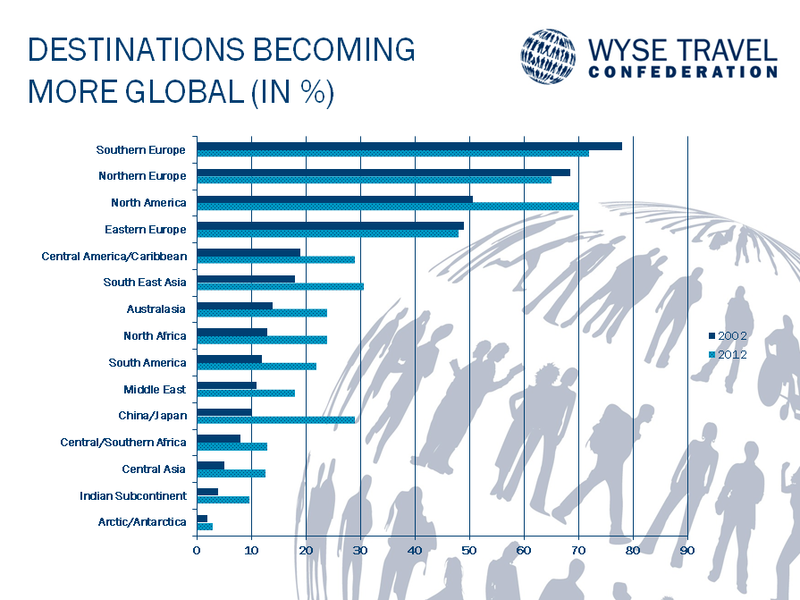 Today’s youth is clearly a generation of global travellers, according to the WYSE survey. Southern and Northern Europe remain the top two destination regions but have dropped back slightly. In contrast, the Americas, Asia Pacific and Africa have grown strongly in popularity over the last decade. ”Young people are travelling more to long-haul destinations,” Chapman said. Moreover, there is an attractive financial benefit for destinations attracting young visitors. ”Older people tend to stay in internationally-owned hotels, so the profits are exported. However, young people stay in locally-owned accommodation, so their money tends to stay in the destination,” he explained.